TotalWellness is always looking for skilled, licensed and/or certified medical professionals (RN, LPN, CNA, MA, LVN, Phlebotomist, EMT/Paramedic, etc.) who want to work as wellness screeners and/or administer flu shots at nationwide corporate health events. Position is on an as needed basis (per diem/contract work), as an independent contractor, not as an employee. We recruit individuals who are looking to pick up some extra shifts – we cannot offer consistent work. The TotalWellness application process involves 4 steps. Our online application is protected with SSL and AES-256 BIT at rest encryption, which means your data and uploaded documents are safe. Photo ID’s and certificates can be easily uploaded by taking a picture with your phone and uploading the photo file. Once you have completed your application, you will receive emails from TotalWellness. Please check your spam, bulk or junk mail folders if you do not see the emails. 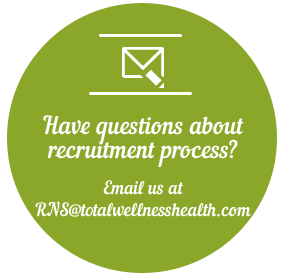 If you have questions at any time contact TotalWellness Recruiting at RNS@totalwellnesshealth.com or 888.434.4358.